Want some darling artwork for your nails this Valentine’s day, but you do not want to spend the ridiculous amount of money for your nail technician to do it? Why not try some easy DIY nail art at home? 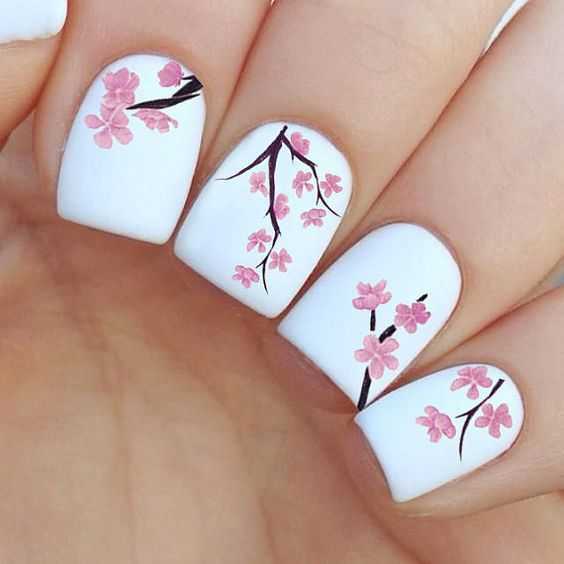 Here are ten of the best (and cutest) I could find for you to paint up your Valentine’s Day nails and celebrate the holiday of love. 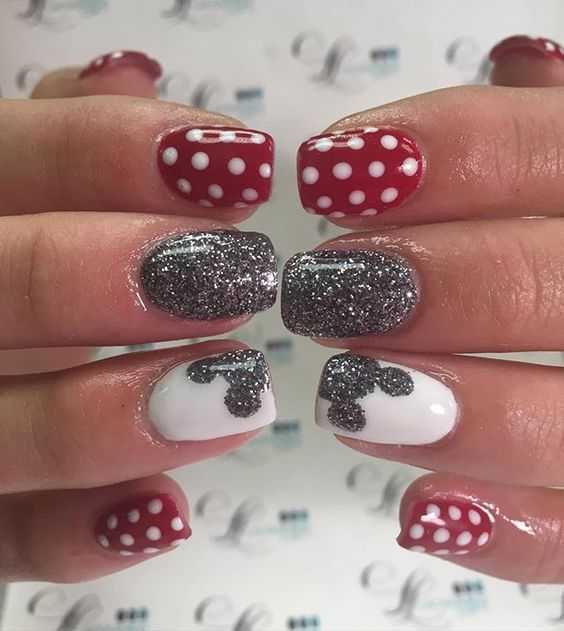 If you are a lover of glitter, polka dots, and Disney, you will adore these mani’s. You may need to create your own stencil if you can’t freehand the classic Minnie mouse silhouette, but hey, if you can’t even do that, just slap a bow on there and call it cute. Marble patterns are everywhere. Phone cases, makeup packaging, clothing – literally everything. 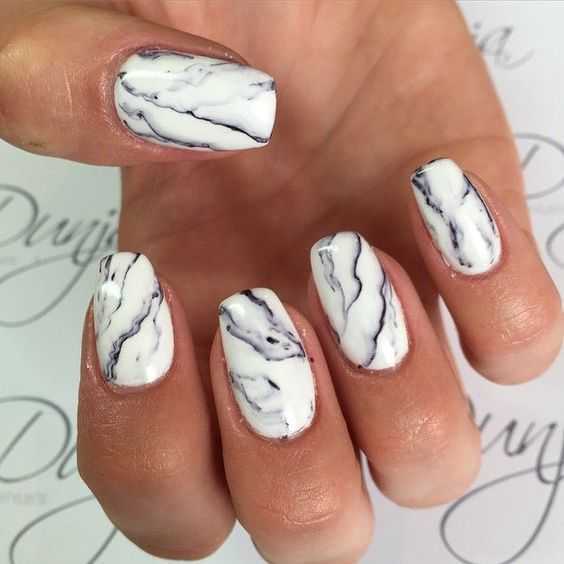 So if you want to be unique, but still on trend, go with these bright white marbled Valentine’s Day nails to catch the eye of your date and probably everyone else in the room, too. Pinks and reds are classic staple colors of V-Day, but you do not want the cheesy hearts and roses literally every other woman will be getting. That is where cherry blossoms come in. 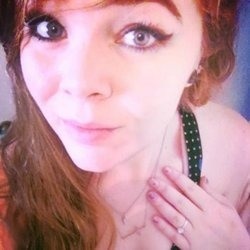 They are gorgeous, unique, and most importantly affordable. Now this may take some skill, so if you are struggling with painting your own nails in the first place maybe skip this one. But for those talented ladies out there with a steady hand, go crazy with tribal, water color, and lovely valentine designs. 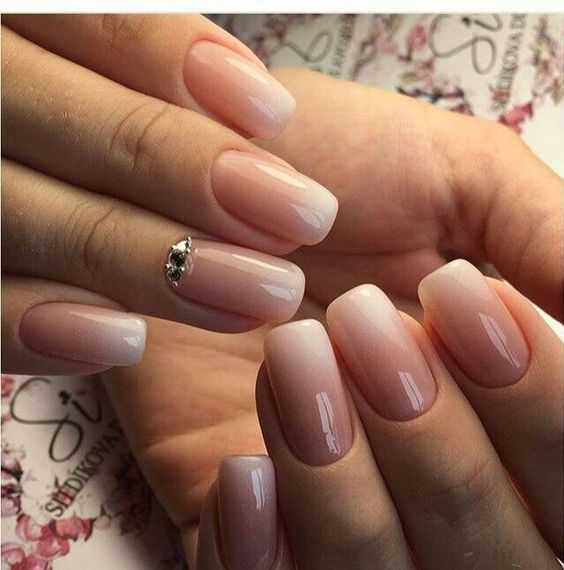 If you want something a little simpler, yet still noteworthy, take a risk with nudes. Use the natural base of French tips and add to them with white polish. You can create any design, but on Valentine’s Day I think hearts – even though cliche – would be adorable. 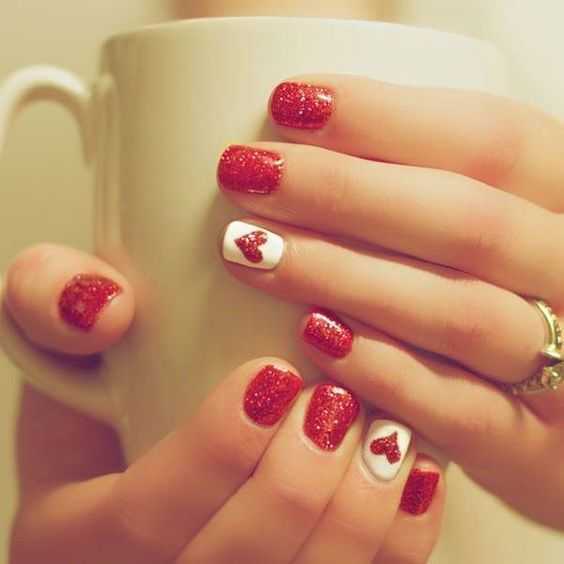 If you are looking for a more traditional Valentine’s look, go with a simple red or pink glitter nail art. 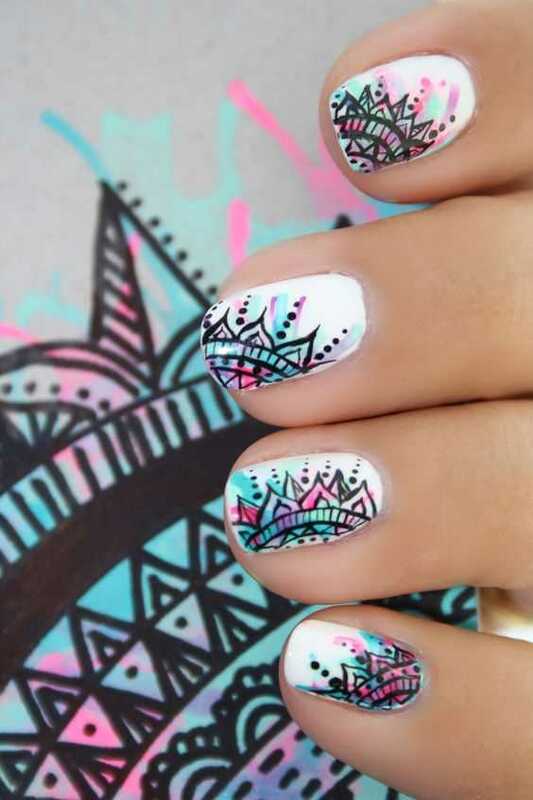 You can make it more unique with a cute design on your ring fingers, or middle fingers if you are just a little sassy. If you are not the cutest type, these claws are for you, girl. Go with black or even silver, and have your nails as sharp as your winged eyeliner. 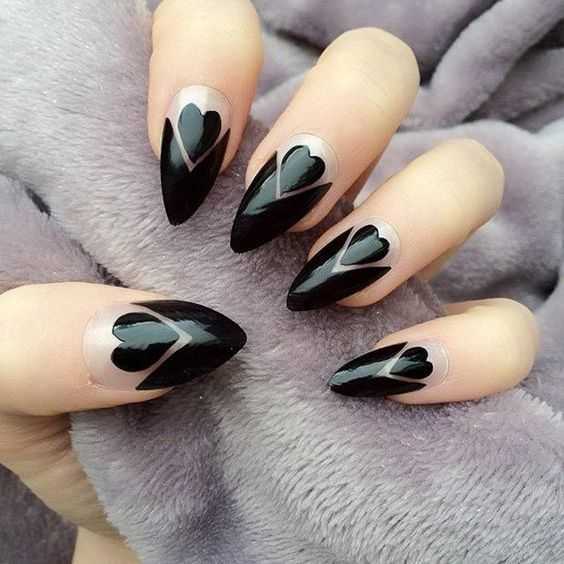 This black French tip has a unique design and twist for those of us who are a little more on the dark side of style. If you are not the soft grunge type like number seven, how about a soft glam type? Choose any color of your liking and create a soft, glowy nail with the ombre effect and a little extra gloss over the top of it. If you are loud, proud, and want to reflect that with your nails, why not some hot pink cheetah prints and tons of crystals? Okay, the cheetah print might be a bit much, but hey – you want people to notice your nails, right? Wear your heart on your sleeve, girl. Well, on your nails to be precise, but they are close to your sleeves. 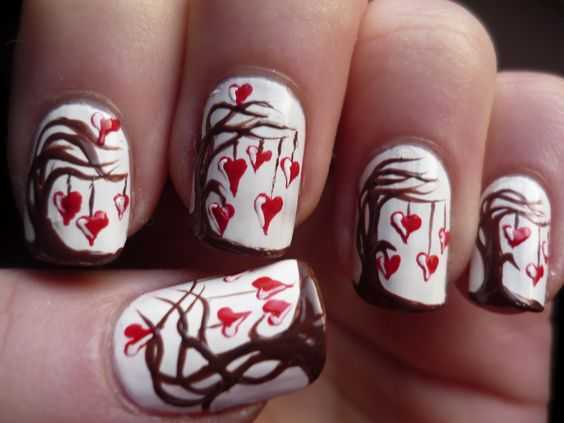 Show your openness to new love by growing some hearts on your nails. New year, new love, right? Those are all the Valentine’s Day nail designs and suggestions I have now, so choose one, or just draw inspiration, but remember to rock your nails this Valentine’s Day!